Democracy is beautiful; democratic politics is ugly. Anyone who has sat through an American presidential campaign will nod in knowing agreement at that statement. Egyptians are now learning its truth—and teaching it quite forcefully to the world at the same time. 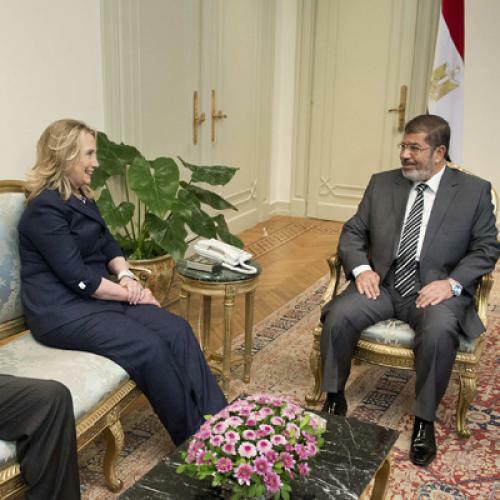 Elections in Egypt produced an Islamist parliament and, after that was dissolved by the courts, an Islamist president. International actors, the United States foremost among them, then rose to the occasion. Rather than rejection and horror, the Obama administraiton instead tried coping and coaxing. Egypt’s Muslim Brotherhood reciprocated, working to square the circle on its commitment to the Palestinian cause, to prioritize its commitment to economic reform, and to speak to visiting diplomats and potential investors in the language they liked to hear. That process went more smoothly than might have been expected, but it has now hit a major speed bump: Egypt’s shaky democracy-in-the-making has not simply produced political leaders who are difficult partners, but also a kind of domestic politics that is characterized by a degree of hyperbole and a range of reckless charges that would make the most shameless robocaller blush. It’s important to note that Egypt’s domestic political process is actually surviving the rhetorical race to the gutter. A new constitution is being written; civilian control of the military is slowly evolving; and the new president has used his temporary dictatorial powers both sparingly and wisely. But the country’s foreign relations may have suffered a blow with the attack on the U.S. Embassy in Cairo. The attack itself that will cause problems for Egypt’s diplomacy; foreign audiences that learned to cheer for Egyptian crowds last year will now learn again to fear them. An even greater problem will be caused, however, by the slow and quirky official Egyptian reaction to the violence done by the demonstrators. Egypt’s leader (and the Brotherhood movement that nurtured him) reacted in a very shrewd and agile manner to events—as if all that mattered was Egyptian public opinion. President Muhammad Morsi himself held his tongue for over a day. The only visible action he took was to direct the Egyptian embassy in Washington to take legal action against those who made the film that sparked the protests. He spoke out against the attack only when his silence had deafened many overseas, and still coupled that statement with an insistence that insulting the prophet of Islam was a red line. The Brotherhood movement, for its part, reacted first by issuing its own denunciations of the film, calling its own demonstrations (in locations far away from the U.S. Embassy), with some figures intimating that the film was inspired by Zionists (in order to defuse sectarian tensions within Egypt). The logic, at least for a sophisticated Egyptian audience, was clear: Seize control of the issue but deflect the anger, lead the crowds away from flashpoints, and ensure that protests not take such troubling form. And yet again, inexplicably, it took some time for the Brotherhood’s own spokespeople to criticize the Embassy attack. But however much the Egyptian response involves domestic political maneuvering, it has also revealed a gap in principles between the two countries. It is not that Americans lack respect for religion or that Egyptians do not value freedom of speech. But few Egyptians would extend speech protection from political talk to attacks on religion. And few Americans would criminalize bad manners and obnoxious movies. Both societies are outliers on opposite sides of the international scale on these principles: I have often surprised Islamist interlocutors in the Arab world, for instance, when I have informed them that Holocaust denial is perfectly legal in the United States. Relations between Washington and Cairo are also increasingly inextricable from the personalities of our leaders. It undoubtedly matters that Egypt’s president is Muhammad Morsi. Most Brotherhood leaders I have spoken with in Egypt are engaging and polite in personal conversation. But most Americans (myself included) who spoke to Morsi before he was president used the same word to describe him: prickly. Egyptians often reported more genial impressions. Morsi has grown considerably on the job, but it is difficult to escape the impression that when it comes to foreign relations by temperament he is a bit better suited to the role of bad cop. Whether American leaders regard the events of the past few days as a teachable moment or a moment of truth is not yet clear. If steady hands and far-sighted leadership prevail, the first approach will dominate. But here we run into our own democratic politics: In a presidential election campaign domestic tactics can easily trump international strategy. The quickness with which the death of American diplomats in Libya, along with the events in Egypt, became fodder for campaign mills should not be surprising, nor should the U.S. media rush to focus on the implications of events for the election in November. In the immediate aftermath of the Egyptian revolution, I was asked by a Brotherhood activist what I thought the rise of the movement would mean for the United States. I replied that it would be a headache but not cancer. If my diagnosis is still correct, what’s needed to treat this crisis in U.S.-Egyptian relations isn’t surgery, but aspirin. Nathan J. Brown is professor of political science and international affairs at George Washington Univeristy and nonresident senior associate at the Carnegie Endowment for International Peace.